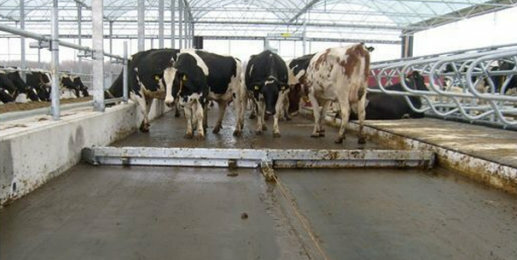 This automatic rope driven scraper from Spinder is a low maintenance, cow friendly way to keep your barn floor clean. The scraper consists of 2 low power, single-winch drive units, a number of high quality synthetic corner wheels, and one or more scrapers which are pulled by an 8mm thick PE rope. Digital time clock, frost protection and overload protection. The scraper can be configured to fit your passages and available space exactly even when there are an odd number of passageways or space is limited. See a video of the scraper in action.